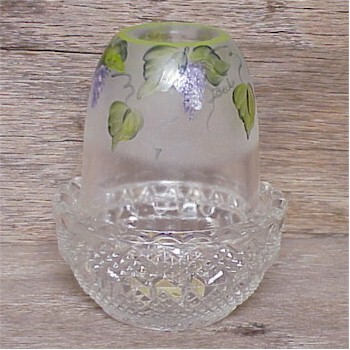 Hand Painted Wisteria Fairy Light, Bargain Shack offers Boyd Glass, Mosser Glass, L.G. Wright, and Contemporary Collectible Glass including Vaseline Glass - J.B. Scottie Dogs, Pooche, Animal Covered Nests, Toothpick Holders, Salts, Glass Animal Figurines, Clowns, Dolls, Slippers, Vehicles, and More! This beautiful Mosser two-piece fairy light in Crystal Satin with Hand Painted Wisteria stands 3-1/2 inches tall. The inside of the crystal base has the Mosser signature mark of an M inside the outline of the state of Ohio. This piece is also signed by the artist.